1. This is not a competitive race. It is a march with a purpose which is to promote peace and non-violence. 2. All participants are expected to walk together under control of the marshals as the area is also used by the general public. 3. Each participant will receive a wrist band which must be shown at the end where it will be exchanged for a medal. If you wander off the route a marshal will snip off the wrist band as the GDT and the Organisers will not be responsible for anyone who leaves or deviates from the march. 4. Only the first 1000 participants will receive T-SHIRTS. Accept our apology if you did not receive a T-SHIRT as our estimate of T-SHIRTS is based on past participation and our records will assist us in providing T-SHIRTS next year. (NOTE: this record is taken form the number who actually finished and collected medals). 5. Any person who has wandered off and arrives after the march is officially ended will not receive a medal. 6. All persons coming by bus to the beach-front must ensure that you do not wander off as the buses will leave within one hour of the end of the event. An announcement will be made bringing the formalities to an end and persons that need to take the bus must proceed to where they alighted from the bus. 7. Children ( under 16) must be accompanied by their parents or guardian who will sign the entry form on their behalf. 8. School groups must be accompanied by the educators or their nominees (must be adults) who will sign the form on their behalf. 9. Any participant seeking medical or any other assistance must inform the marshal closest to them. 10. Since the march is under 5 km there will be no watering table on the route. Participants are advised to carry water and other refreshments. Please refer to the note below. NOTE: AT THE FINISH, EACH PARTICIPANT WILL HAVE THEIR WRIST BAND REMOVED and will collect their medals. If you do not have a wrist band you will not be allowed to enter the finish arena. I have read and understand the rules above and agree to abide by them. I hereby confirm that I will participate in the march at my own risk. 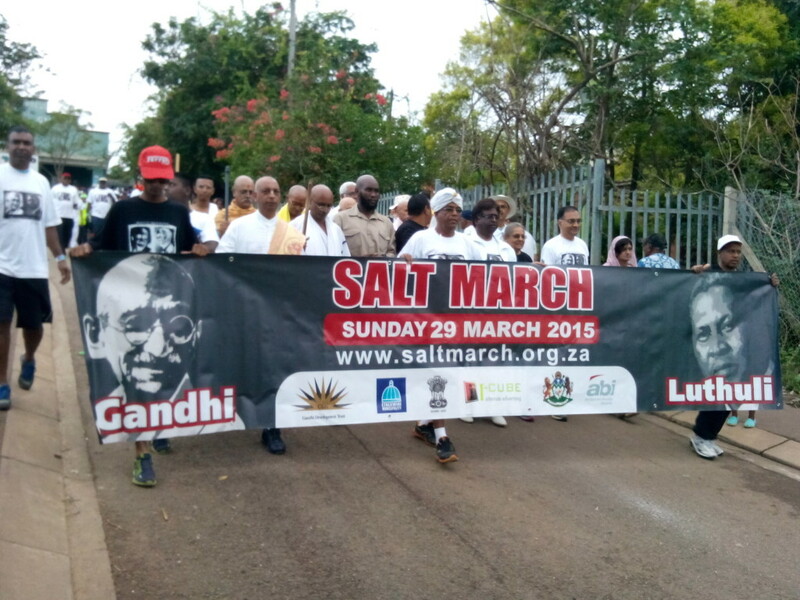 I indemnify the Gandhi Development Trust, The Salt March Committee, Partners and Sponsors against any claim which may arise from my participation in the march. Emergency contact numbers are:- Ronnie Govender 076 145 5803;Leon Naidoo 083 379 1107; Kidar Ramgobin 082 774 7162.